I have said it time and again the first step in finding gold is to find a location to prospect. A sure fire way to find gold is to look where gold has been found before. I find the internet to be a very useful tool in gold prospecting. Mindat.org is what I use very often, it’s very easy to use. From the home page you will find a box that says search mindat. In the box for mineral name type in Gold and then in the locality name type in the location that you have in mind and that could be a State, County, Town or Mine name. If one doesn’t work try another and hit search. I usually start with a state and hit start. Then it will bring me to a page with a list of mines, then I will choose one of those mines. When you click on the mine it will show you the specific minerals that were found present in that mine. I then locate the mine on a map and make a note of it. Next I will search for a geological report of that mine with the USGS. I would give you a link to this site but it is currently down at the time of this writing due to the Federal Government shut down. I find the report and find out how much gold was assayed. Even though I find that the mine didn’t contain enough gold to be profitable, there may be enough gold for the hobbyist. The next thing I will do is to go to the map, I will then locate it on a topographical map. I often use the USGS store and go to the map locator. 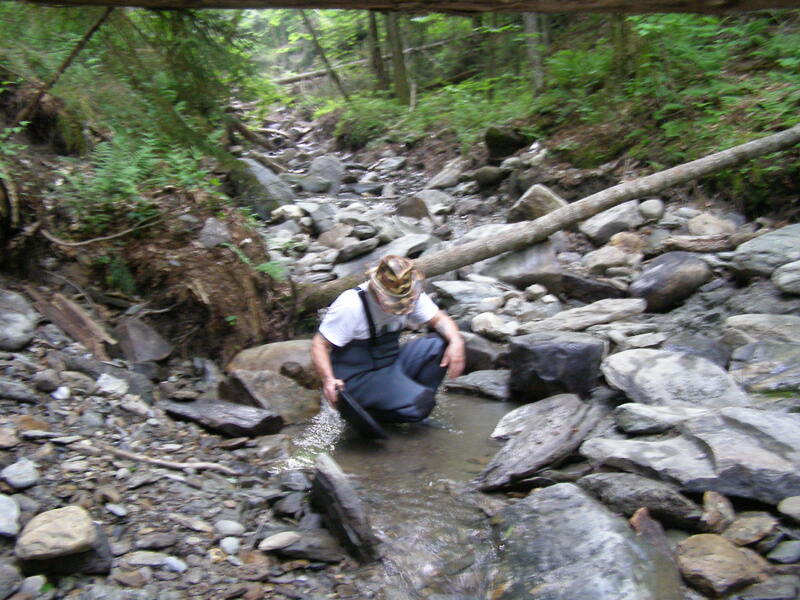 I look for rivers and streams that are near the mine. Near the mine I mean up to a couple of miles. If the mine is on a mountain I will look for rivers running off of that mountain. Once I locate a river or stream I will then look for points of accessibility (public access like a bridge easement.) Be careful some states do not allow prospecting activities on state lands, state game lands and so on. Look for state rules and regulations for the location you have in mind because each state is different. If it is on private property get permission first. When I look at the river on the map I am looking for the vertical drop of the river, I am looking for bends in the river and so on. The next thing I will do is physically go to the location, I will look for that access point. If I have to knock on some doors to get permission then that is what I will do. Once I make contact with the river and then start testing, depending on the results I may stay right there or I may move up or down stream. When I am in an area the curious may come to see what I am doing, I let them know that I am prospecting for gold and sometimes that will open a conversation to a good lead. I have had that happen on many occasions. I like to hear about legends of gold finds, I make a note of it and when I get home I will track that lead down. There are other methods of locating a prospect, this is just one I use often and it works well for me so I will continue. If you have a different method please feel free to share it. Now get out there and find some gold and good luck.